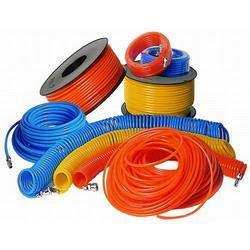 Our product range includes a wide range of pneumatic pipes and nylon braided pvc hoses. Pneumatic P.U Pipes are mandatory in all Pneumatic applications and we keep a vast range from 4 mm upto 14 mm.There are also several variations of Pipes such as Coiled Hose, Hose Reels which is all available under our roof. BRAIDED HOSE PIPE offers far higher pressure capability than-reinforced PVC tubing. It is made from non-toxic Ingredients conforming to USP Class VI and FDA Standard. Mirror Smooth interior permits outstanding flow characteristics conforming and abrasion resistance with flexibility. It Is light in weight so easy to handle. It does not crack when in use or stored for long time. PVC makes the surface smoother and allows better flow of fluid. Its clear transparency allows, air lock and blockage if any, to be quickly detected. Last but the most important part it is 50 % cheaper than Rubber Hose.